Princess Mary was born on 25 April 1897 as the daughter of the then Duke and Duchess of York (later King George V and Queen Mary). The Princess’s great-grandmother Queen Victoria telegraphed “All happiness to you and my little Diamond Jubilee baby.”1 The christening was performed by the Archbishop of York and the godparents were Queen Victoria, the Duchess of Teck, Empress Marie Feodorovna, Princess Victoria, King George of Greece and Prince Francis of Teck. 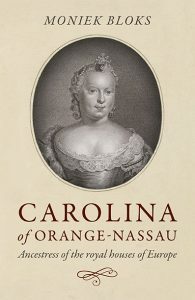 Her elder brother described his sister in infancy as follows, “As a baby, Princess Mary was by far the most troublesome of all the Royal children. I will not say that she was a precocious child in the least – but if being ‘noisy’ as an infant is a sign of excellent health, then the little Princess was endowed with the most sturdy and vigorous of constitutions.”2 She spent her early childhood in York Cottage. She became particularly close to her elder brothers, the future Kings Edward VIII and George VI and became somewhat of a tomboy. She was the only daughter and had five brothers in total. In November 1901, the new King Edward VII conferred upon Mary’s father the title Prince of Wales and the family moved to Marlborough House. As she grew up, Mary became an accomplished gymnast and horserider. Her father became King in 1910 upon the death of King Edward VII. Mary was present for her parents’ coronation in State robes. They were purple velvet trimmed with ermine with a long train. She wore them over a white dress, white satin shoes and silk stockings. She wore a coronet and three ropes of pearls. After her appearance at the coronation, Mary returned to the schoolroom and the care of her governess, Mademoiselle Dussau. In 1912, Mary accompanied her mother on a visit to Germany to stay with the Grand Duchess of Mecklenburg-Strelitz. It was her first journey abroad, and she enjoyed it. On 17 March 1913, Mary was confirmed by the Archbishop of Canterbury in the Royal Chapel at Buckingham Palace. She was growing up to be quite the excellent student and was often ahead of her elder brothers. She began to accompany her parents to some of their public engagements. The Great War began just as Mary was entering adulthood. She became interested in social work and the welfare of the people. She made an appeal to the British people in 1915, “For many weeks we have all been greatly concerned for the welfare of the soldiers and sailors who are so gallantly fighting our battles by land and sea. Our first consideration has been to meet their more pressing needs, and I have delaying making known a wish that has long been in my heart for fear of encroaching on other funds, the claims of which have been more urgent. 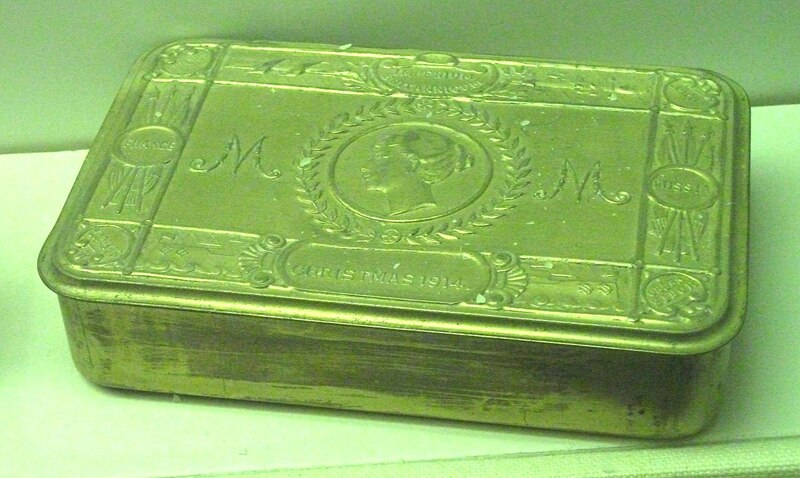 I want you all now to help me to send a Christmas present from the whole nation to every sailor afloat and every soldier at the front.”3 Money began pouring in and soon the gift, consisting of a brass box of tobacco or cigarettes, a pipe and a tinder lighter, was being sent out. During the year 1917, Mary was caught up in her work, but she never complained and soldiered on to do what she could. 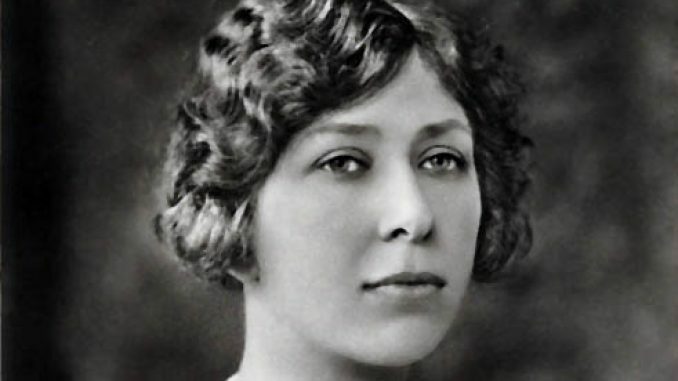 She told a friend, “They were some of the happiest days in my life.”4 On 25 April 1918, Mary celebrated her 21st birthday, but it was to be a quiet event, due to the war. In June 1918, Mary began her nurse’s training, and her mother insisted that Mary was not to be treated any differently. She was greatly loved by the patients and her fellow nurses. In April 1920, Mary had to leave her work at the hospital. Her wedding dress was in white and silver. The embroidery consisted of seed and baroque pearls and tiny diamonds. The train was woven at the Braintree Mills and was 20,000 threads wide. On either side of the train was Honiton lace embroidered in silver thread and seed pearls with the rose, shamrock, thistle, daffodil, the lotus of India, the maple of Canada, the wattle of Austrialia and the fern of New Zealand. Part of wedding veil lace was said to have belonged to Catherine of Aragon, Henry VIII’s first wife, and her mother and grandmother had worn it before her. The future Queen Elizabeth the Queen Mother was one of her eight bridesmaids. 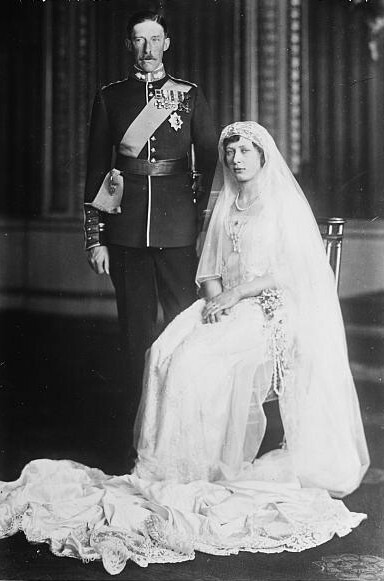 The wedding took place on 28 February 1922 at Westminster Abbey. They honeymoon in Italy, via Paris. Upon their return to the United Kingdom, Mary and her husband settled into their new life. Her husband possessed not only a London home but also an Irish estate and a home in Yorkshire. They spent the greater part of their marriage in Yorkshire at Goldsborough. Mary was soon pregnant, and she spent the winter preparing for the arrival of their baby. On 7 February 1923, Mary gave birth to a son named George. Her husband commented, “I hope he will resemble his mother.”7 Mary was sent a robe by a mother whose baby she had helped nurse, though the child had tragically died. The mother wrote, “I send these to your little one with my love to him, and may he live to gladden your heart as mine would have had he lived.”8 A second son named Gerald was born in the summer of 1924. After her brother’s abdication, she and her husband went to stay with him in Vienna. During the Second World War, she once again picked up her social work and became the chief controller of the Auxiliary Territorial Service (renamed the Women’s Royal Army Corps in 1949). Mary was widowed in 1947, and she continued to live at Harewood House with her eldest son and his family. She became a grandmother for the first time in 1950. During her widowhood, she continued to carry out royal duties. She attended the coronation of her niece Queen Elizabeth II in 1953. One of her last official engagements was to attend the funeral of Queen Louise of Sweden in March 1965. Later that same month, Mary suffered a fatal heart attack during a walk in the grounds of the Harewood House. She was still only 67 years old. British Pathe has some footage of the funeral and memorial service.